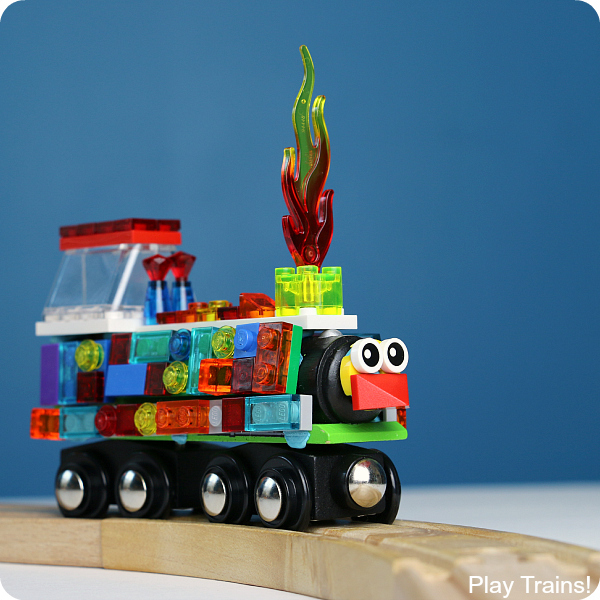 Children love to combine their DUPLO blocks and LEGO bricks with their wooden train sets. But, if you’ve ever tried it in your home or classroom, you probably have had the same experience we did, with the tracks sliding off the blocks and bricks. 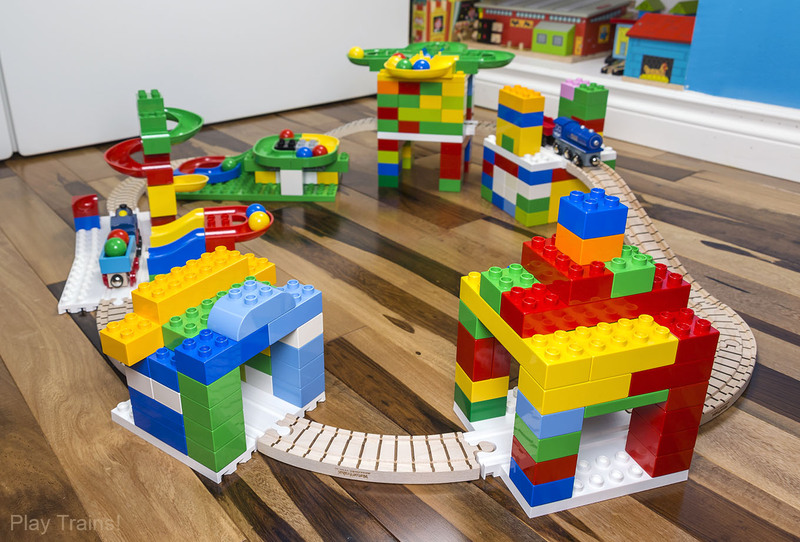 That’s why I thought Dreamup Toys block platforms were brilliant when we first reviewed them: they provide a stable connection between these two popular types of toys. Better yet, they also work like blank canvases, encouraging creativity. 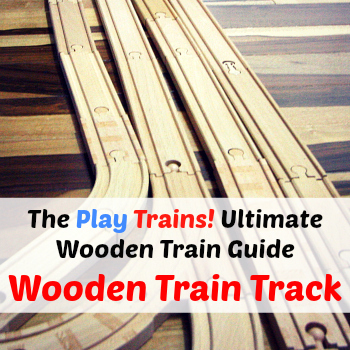 So I was very excited when Dreamup Toys sent us a sample of their first Dreamup Toys Wooden Train Set to test out and review! This post contains links to Amazon.com. Read our disclosure policy for more details. Thank you to Dreamup Toys for providing us with the set for this review. 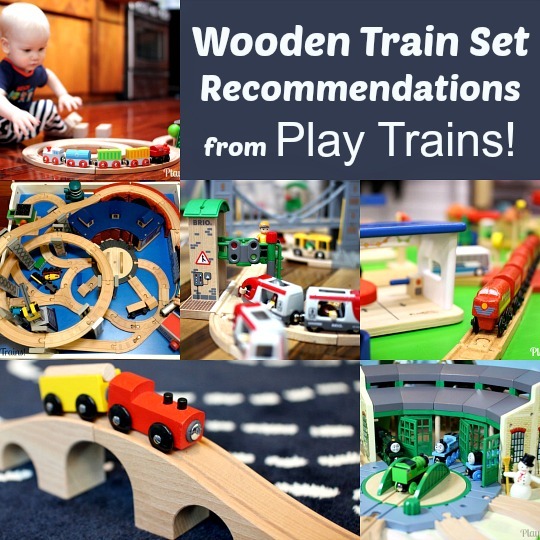 The Dreamup Toys Wooden Train Set takes their awesome wooden train block platforms and pairs them with beautiful, high-quality Maple Landmark wooden train tracks, which — like the Dreamup Toys platforms — are made in the USA. You get six of the platforms plus four short curves, four long curves, and two ascending tracks. 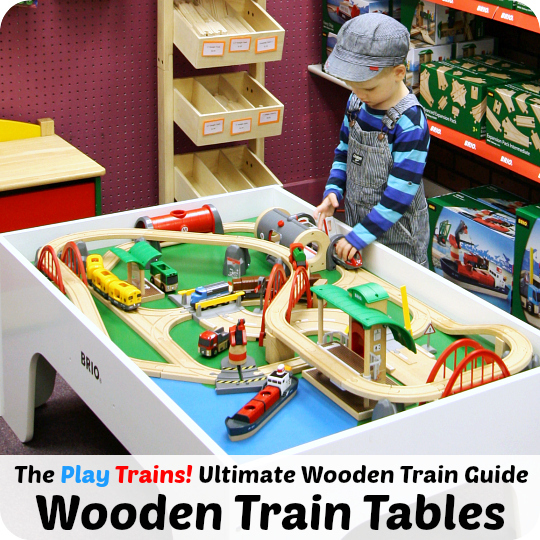 A four-car wooden train is also included in the set (not pictured). There are instructions for several different configurations of the platforms and tracks. I’m really impressed with the number of different layouts that are possible. My son, who prefers to bypass instructions and create his own designs, was happy to see that other less symmetrical layouts are possible with the included tracks and platforms. This set is deceptively simple in its components, because if you connect multiple platforms together, their connections are able to shift enough that you can arrange them in a slight curve. 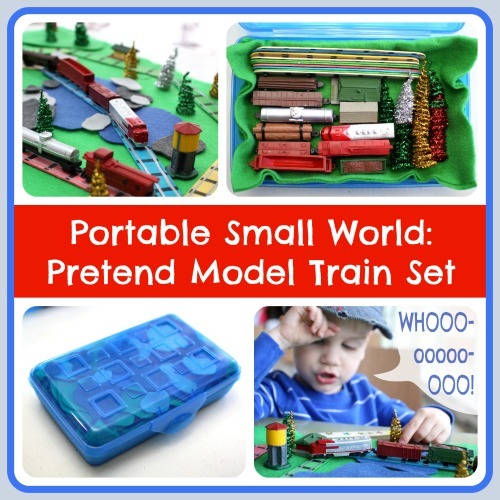 Just like when we first got our Dreamup Toys platforms, it was amazing to watch how much this set inspired my almost seven-year-old son to play with both his trains and his DUPLO blocks. So much so that days later, he’s currently playing with them by himself as I type this review! 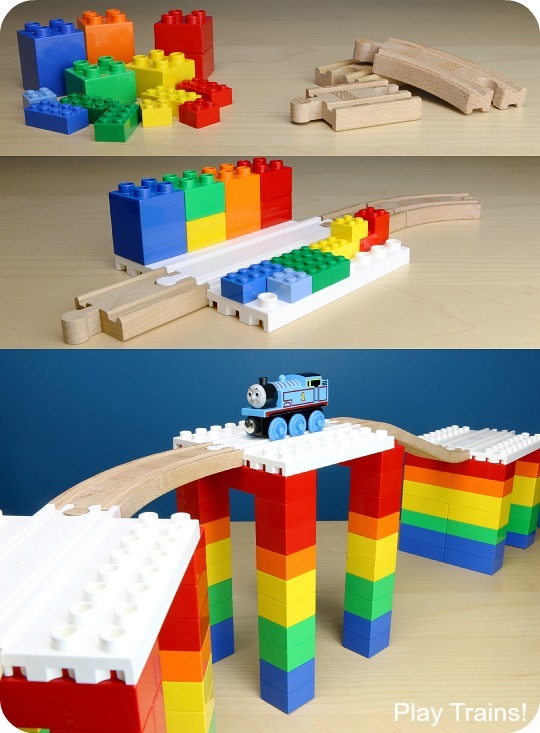 This time, he had a lot of fun adding his Hubelino marble run blocks to the DUPLOs and trains, creating a game where we needed to load marbles to fuel our trains. 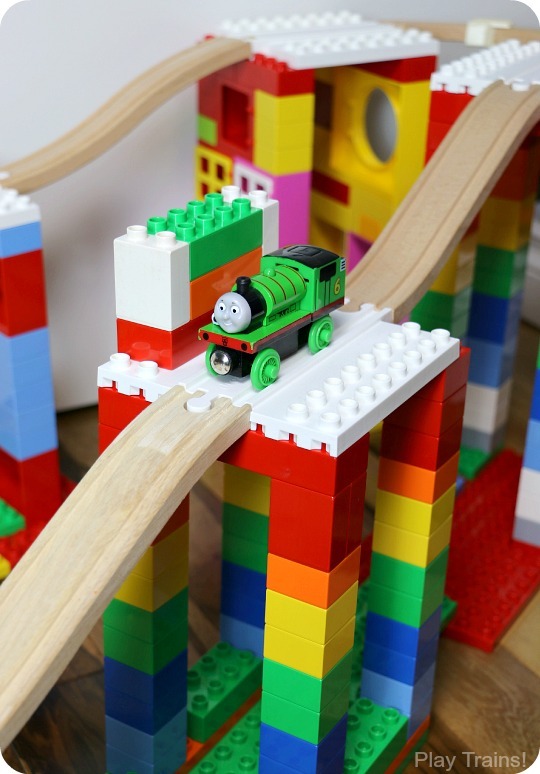 One thing to note is that there are no blocks or bricks included with the set, so if your child doesn’t already have DUPLO, LEGO, Mega bloks, or another compatible brand, you’ll want to purchase some to go with this train set. The nice thing about that is you can choose which brand and set to buy. It also offers a great opportunity for different family members to coordinate gifts to work together, with one buying the Dreamup Toys Wooden Train Set and others buying DUPLO or DUPLO-compatible sets. I recommend DUPLO over other brands because of its high quality plastic, especially the DUPLO Education line of sets that give you a lot of appropriate blocks to work with. (Note that while some smaller, regular LEGO bricks will fit on top of the platforms, they don’t work for building supports underneath, which is why I mainly recommend DUPLO-size blocks if you’re buying them specifically to combine with the platforms.) In order to have enough blocks that are big enough to support the platforms plus more to build on top, I’d suggest either getting this set of basic DUPLO blocks or buying a DUPLO Education set, such as the Creative LEGO DUPLO Brick Set or the LEGO Education DUPLO Town Set. We also really love our Hubelino marble run sets that I mentioned earlier, and the Dreamup Toys platforms are perfect for working them into our train layouts. 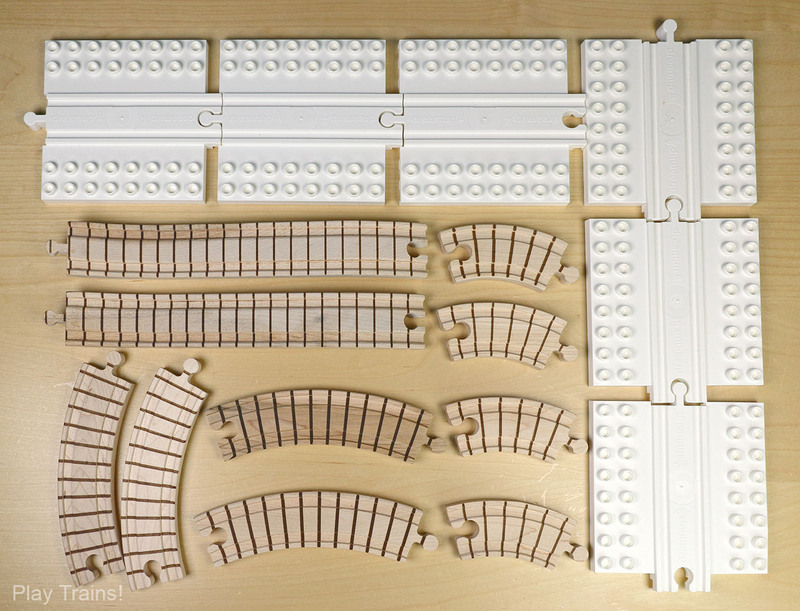 Some Hubelino sets also come with plain DUPLO-style bricks, if you don’t already own them. If you’re looking for a lower-cost alternative to DUPLO (and Hubelino), we just got some Strictly Briks-brand DUPLO-compatible blocks to test with the Dreamup Toys platforms, and at least for now they work just as well as DUPLO blocks. (Time will tell how they hold up to lots of play.) I would recommend getting one of the 204-piece Strictly Briks large peg sets, which combined with a set of their large peg baseplate sets was just enough to build something on each of the six Dreamup Toys platforms (although my son would have liked to have had even more bricks!). 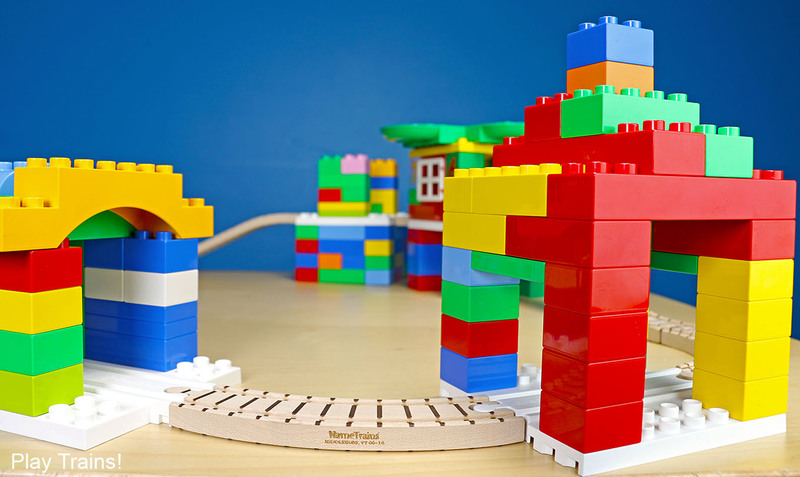 For more information about Dreamup Toys block platforms, check out our parent’s guide to building with the platforms, and our post about creative building play with them. 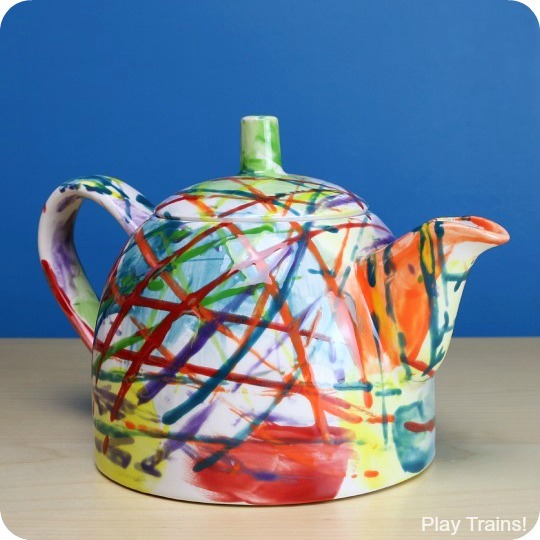 Want to Inspire Inventive Play? 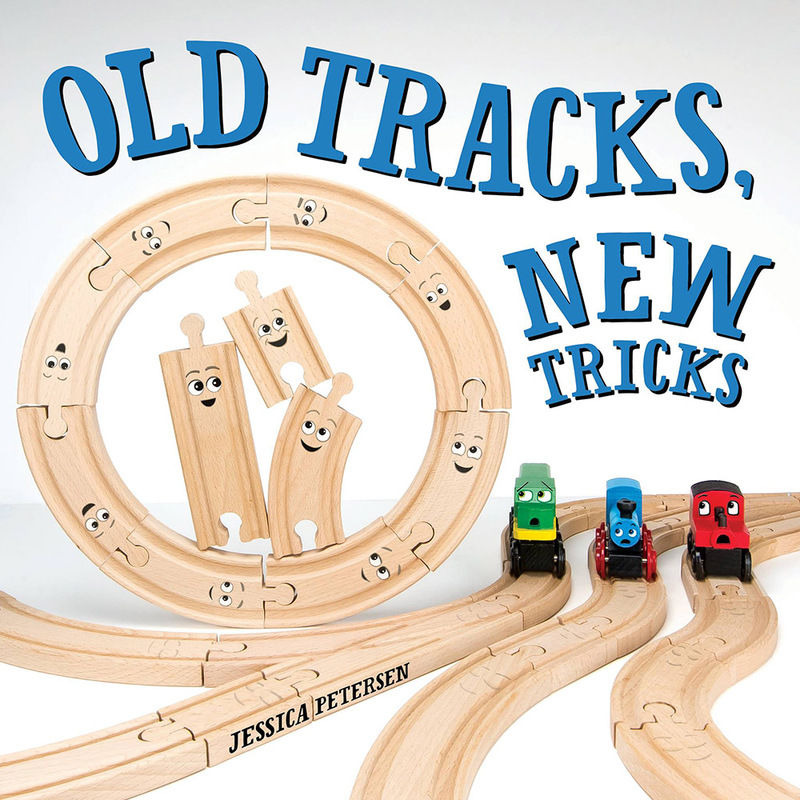 If you’re interested in encouraging your child to play in new and creative ways with their trains, you’ll find everything you need in this wooden train picture book. 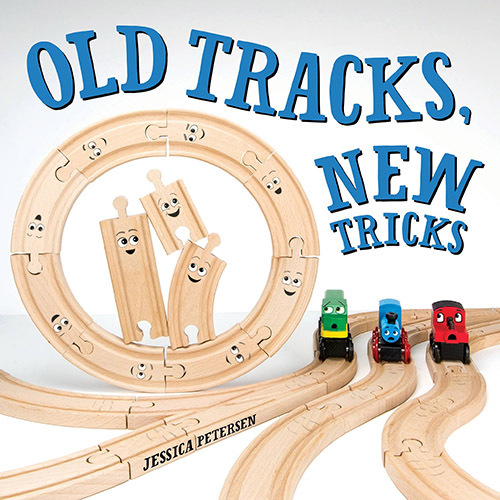 Part fun, rhyming story, part STEM/STEAM activity idea book, Old Tracks, New Tricks is the perfect way to get any kid excited about making new fun with their old favorite toys. 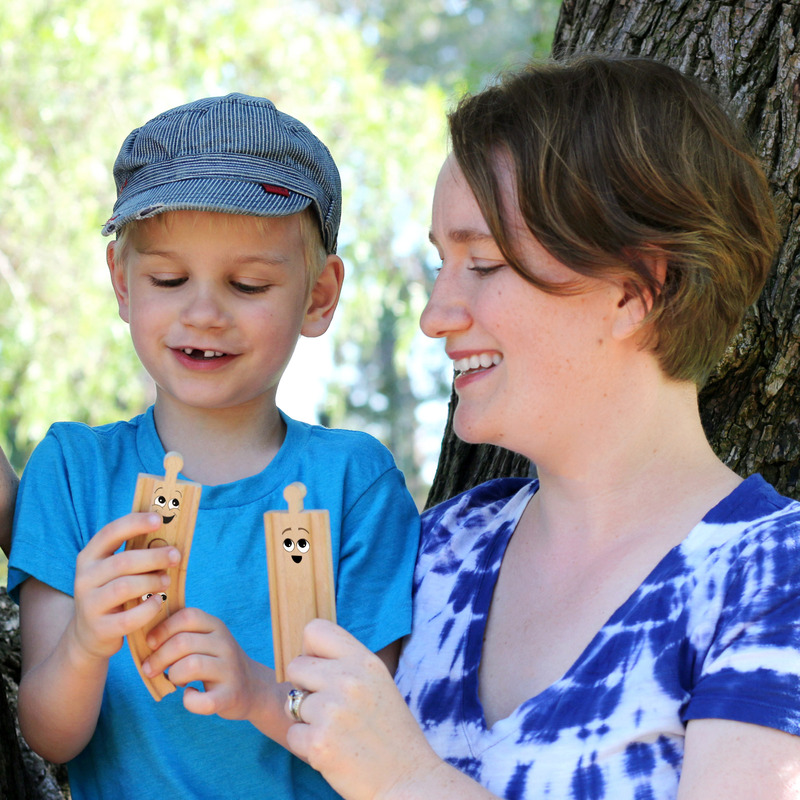 And as a gift, it would make a great accompaniment to a Dreamup Toys Wooden Train Set or Block Platform Pack!